When we arrived at the Pier near Richmond Point the only suggestion of herring were the hopeful women and men fishers lined up along the railing. The gulls and cormorants were bobbing in the slow ebb and flow of a mid-tide, giving no indication of the wild feeding that was reported in the area on the day before. Not much was happening. There was a time when winter herring fishing in the San Francisco Bay was an annual bonanza – but after some serious overfishing for the export market (herring roe are a prized food in Japan) the stocks were pretty depleted. 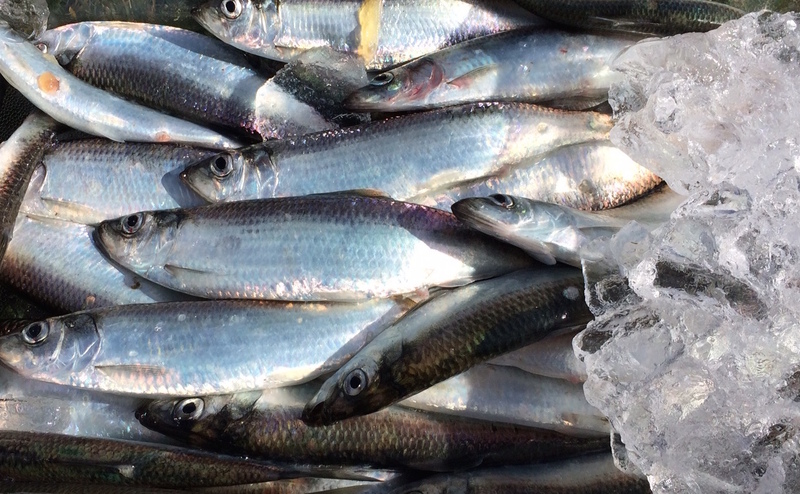 The commercial fishery was closed for a time and last year the herring were back in abundance. Each winter the herring come in waves from the open Pacific, pass under the Golden Gate Bridge, and seek out shallow eel grass beds to spread their milt and eggs. Some days are thick (like yesterday) and some are not (like today). Still, as we unloaded our gear (cast nets and fishing rods) we could tell that folks of the pier were catching a few. And a few would probably be enough for a boy and his dad looking to capture a bit of the bounty. Cast nets are the traditional harvest tool of choice for the thick days but today was going to be about a slower method: five small, hooked psuedo-bugs daisy-chained together. Called a sabiki rig (a Japanese invention), these ganged hooks are mostly used to catch bait. Herring might be bait or dinner, depending on your perspective and your willingness to try out different parts of the food chain. After an hour we had 30 or 40 in the cooler and Sage was getting cold from the wind. We picked up and we called it a morning. In truth though, fishing is never just about the catching. Much of the work still lies ahead – cleaning and preparing the fish for the next steps in the dance. In the case of herring (and other oily fish like salmon and sardines) this next step must happen almost immediately. All that delicious and nutritious oil starts to go bad in matter of hours – certai nly within a day or so. And gutting and filleting small fish is pretty laborious. Still, like so many things I whine about, once you get into a rhythm it goes along smoothly. Now longer in the the tooth myself, I find a certain meditation in the repetitious work of the kitchen – the chopping, slicing, and cleaning. Somehow knowing that the repetition leads to sustenance – a daily repeating need for self and family – makes it quietly heroic as well. With herring there is scaling, gutting, and filleting (for the pickles). 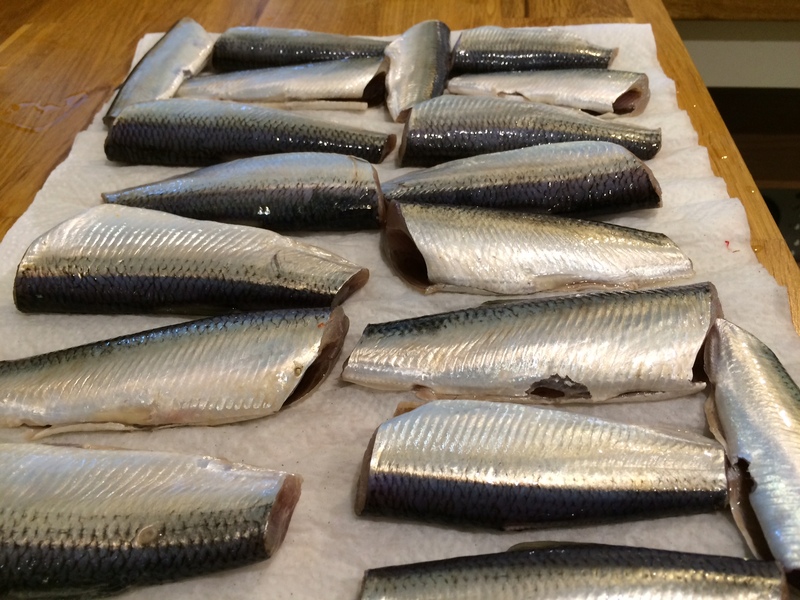 I had chosen two recipes – one for smoked “kippered” herring and another for pickled herring. I also made a quick lunch following Hank Shaw’s rendition of Scottish-style fried herring – brushed with mustard, coated in oats and fried till crisp. I didn’t even get a picture! I have eaten a lot of fish – in all shapes and sizes and in many parts of the planet. And I like a can of good sardines or kippers as much as anyone – fishy though they may be. But it must be stated clearly that even the oiliest little fish, if handled carefully and processed quickly, can be deliciously delicate in flavor. 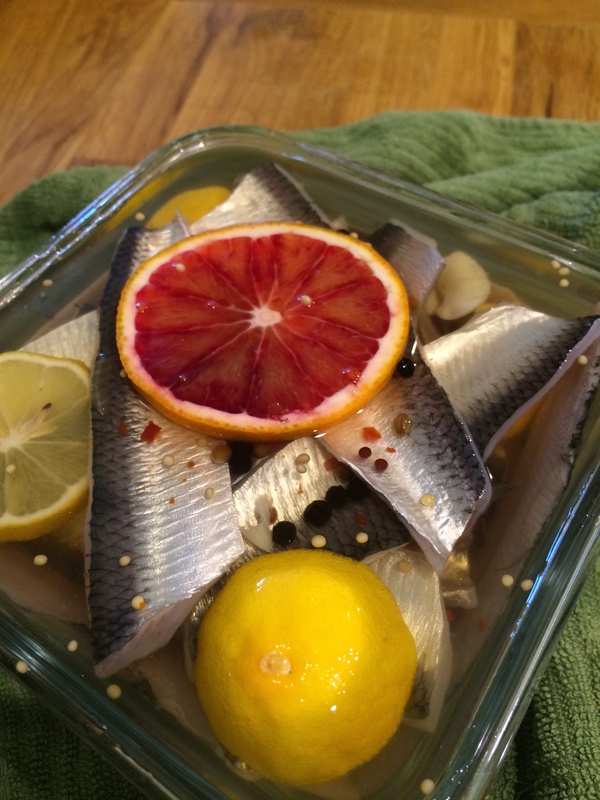 And these herring have been just that – delicate and delicious. I love them as pickles with a bit of creme fraiche and chopped dill on dark rye. I’ve never been to Scandinavia, bit this must be pretty close to the real deal. This entry was posted in GeoKitchen Posts and tagged Featured Post on February 6, 2015 by garyfleener.